Getting good results from a hatch will depend on the correct operation of your incubator. You should of course be familiar with your incubator manufacturer’s instructions before you make a start but there are a number of pitfalls to watch out for and subtle differences between different incubators. There are two basic types of incubators ‘still air’ and ‘forced air’ (contains a fan) and these need to be set up in a slightly different way. As there is no fan to ‘mix up’ the air, ‘stratification’ of air takes place – in other words, the temperature increases with height. (Remember those science lessons where you were told that hot air rises?) My ‘Brinsea Polyhatch’ incubator recommends 39.2° at the TOP of the eggs for hens eggs – this should be the correct incubation temperature for them (in this case 37.5°) at the centre of the egg. Remember when making adjustments not to remove the lid or you will mess up the layers of air and be taking the wrong readings. Forced-air incubators use fans inside the incubator to provide air circulation around the eggs. This ‘mixes’ up the warm air, providing an even air temperature throughout (or at least in an ideal World, in reality, there can be slight differences). The temperature in forced-air incubators should be set to the exact incubation temperature that the eggs require (e.g. 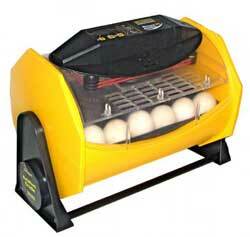 37.5°C for chicken eggs) and can be measured anywhere inside the incubator within the air flow. Recommended temperatures vary between the two types of incubators, so do follow the manufacturer’s recommendations. Next, you should check the accuracy of your thermometer. The accuracy of some thermometers can be a little difficult to check. I have 3 identical glass bulb thermometers and each reads slightly differently which in turn reads slightly different to the electronic thermometer! Whilst the resolution on many digital thermometers is good (usually 0.1 degrees) the accuracy is often only ±5% on cheap units. Check the accuracy before you buy. 5% in 37 degrees is a potential error of nearly ±2 degrees! Most incubator manufacturers state in their instructions that the only sure way to set the temperature accurately is based on a successful hatch so if your eggs are hatching late, increase the temperature slightly and if they are hatching early then decrease the temperature slightly. I tend to check my thermometers in a glass of warm water, making sure they are not too far apart, then, I check the incubator against ‘known good’ thermometers that agree with one another. Try to locate the incubator away from sources of heat and draughts, and limit temperature fluctuations in the room. Ensure that your incubator is operating at the correct room temperature – most incubators don’t work outside of normal room temperatures so you will usually have to find a room in the house that doesn’t change in temperature too much. Ideally, turn the radiator off if your heating is on as not only does the heating cause large fluctuations in temperature but also dries the air considerably that will alter the humidity. This is very important and most of the failed hatches are due to the humidity not being set correctly. Most incubators have a small container in which to add water to and this needs topping up usually every second or third day. Ventilation is equally important since the shells are porous and need to breathe. Most incubators control the humidity by increasing or decreasing the ventilation that in turn increases and decreases the amount of air change in the incubator. Remember the humidity of the air outside of the incubator varies considerably from week to week so it is important to monitor the humidity (inside the incubator) regularly. Modern ‘all singing, all dancing’ incubators have an automatic humidity control which will accurately control the humidity (usually via a pump and humidity measurement system controlled by a microprocessor). There are a few different methods for checking humidity but the most reliable (and value for money) we have found is the wet bulb thermometer (again, just make sure both thermometers read the same temperature to start with). During incubation, keep an eye on the development of the air sack – which should be seen when candling your eggs at the broad end of the shell and should occupy between a quarter to a third of the egg by the time the youngster hatches. The Indian Runner Duck egg shown to the right has been candled at 7 days old and the air-sack (light area at the top of the egg) as well as the developing embryo (middle) can clearly be seen. The humidity should be raised during the last few days of incubation according to the recommendations for the breed. 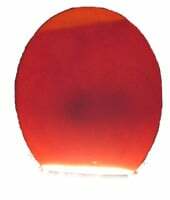 This is normally achieved by adding water to a second reservoir although getting the humidity high enough can sometimes be difficult to achieve. I sometimes add some sheets of kitchen roll folded into a long strip, dangle one end into the water reservoir and let the other hang out. This acts like a wick and provides more surface area for the water to evaporate from and helps me to get the humidity high enough. There is further guidance on the correct incubation humidity here. Hatching eggs should be clean and nest box hygiene is important. Some people (me included) like to clean their hatching eggs with incubation disinfectant as well. It is necessary to run the incubator for at least 24 hours before putting your eggs in. This ensures everything has stabilised. Once you have set your incubator correctly and added your eggs, do not make any further adjustments. Wait 24 hours for let the eggs come up to temperature and stabilise before making any adjustments. Eggs do need to be turned, mimicking the actions of the mother. Your incubator may do this for you or you may have to move a control manually, or you may not be so lucky and have to turn them yourself. If you do have to turn them yourself then it is wise to put a cross on one side of the eggs in soft pencil so that you know which way up your eggs are. This helps if you forget which ones you have turned. You should turn your eggs an odd number of times each day so that they are on the opposite side for each ‘long night’. I would recommend a minimum of 3 turns per day. It is a good idea to move the position of your eggs around inside a still air incubator from time to time as you can get slightly different conditions in different parts of the incubator. This shouldn’t be necessary in a forced air incubator due to the continuous circulation of air. Stop turning the eggs a few days before the hatch (there are different recommendations for different breeds but generally this is 2 or 3 days before the hatch) at the same time as you increase the humidity in the incubator. Be patient… It is best not to disturb your eggs during the first few days as this is the most delicate stage of their growth. After 6 or 7 days you should be ready to ‘candle’ them. Again, be patient! Your eggs should hatch within 24 hours of one another. The difference in time between them can be caused by the differences in storage time and having slightly different incubation conditions in different parts of the incubator. It is important not to take the lid off your incubator as you will affect the humidity that has built up inside. The early birds that have hatched should stay inside the incubator as they need to dry out fully for several hours before they are moved to your brooder. Taking the lid off too early will make it harder for the others to get out of their shells. Chicks do not need to eat or drink during the first 24 hours as they have had a sufficient amount of nutrition from their egg yolk – this is why day old chicks can be shipped around the country. Once the first few hatchlings have dried out and the hatch is well under way (I often leave mine overnight), you can move them out of your incubator to your brooder. You are now ready to raise them but don’t forget to clean and sterilise your incubator after the hatch before too much of the mess gets dried on! The video clip above was taken at double normal speed and shows you the last 6 minutes of a hatch (the eggs are Copper Black Marans eggs) using an Rcom King Suro incubator. These have an exceptionally good viewing window as you can see from this film.